Ah! I'm very excited! Got the new 1.6Ghz Quad-Core, dual Xeon CPU Dell SC1430 a couple of days ago! BIOS resets the boot sequence when you change SATA settings (like changing AUTO to OFF for a drive). So be wary of this feature when you see a black screen upon bootup! I spent about eight hours debugging why wake on lan wouldn't work on my newly built Fedora 12, x86-64 system. Went through a million threads, learned something about sleep states in Linux..finally got it by putting a line at the top of /etc/init.d/halt script (called by "shutdown -h now") to remove the kernel module (rmmod tg3) for the ethernet driver. Self-evident, right? NOT! What the F? As people add comments regarding memory that works in the SC1430, I will post updates to this section. Note: It would behoove one to read the full comments section for any gotchas. The first thing I wanted to do was use my ATI Tech Radeon 9200 128 MB PCI Video Adapter with it. Well, no go, as I got a blank screen. Much surfing the net later, I found that only the first two PCI-X slots (PCIX_SLOT5, PCIX_SLOT6) will allow a working video adapter. And so far, folks have only gotten the VisionTek X1550 Radeon Pci 256MB VGA Dvi-i Tv Out) to work on this box. In the opposite vein, a couple of us have had success taking a dremel to the 8x PCIe slot to make room for 16x graphics adapters. MarioM had success getting the Sapphire x1950GT 512mb card to work with his newly dremeled slot! Bolstered by Mario's success, I also dremeled SLOT3_PCIE with success (video coming). But for God's sake, BE CAREFUL if you attempt this! You can easily damage and/or otherwise FRY your motherboard if you slip up. Click on the comments below for the success stories. Finally, the video below shows a successful dremel job on the SC1430. Free2go had success using the PCI NVIDIA Quadio NVS vidso card in one of the PCI-X slots using 7.1.8.4 driver. Sapphire Radeon HD 4850 confirmed as working in the box. Thanks Subbu! Ati hd4630 confirmed as working in the box. Thanks Daniele! Fedora Core 6, x86_64 installed like a champ and is working well with the onboard video. Cinelerra is installed and running without issue. Love to see all eight cores busy through mpstat..yeah! This patch does work, as I've been running on Fedora 7 with the patch for about two months now. The fans are somewhat loud on boot, but mellow to a comfortable, if not quiet, level after the system boots. Note that the fans will run high speed (ie, LOUD) if the case is open. Finally tried the above FSB overclock. Suh-WHEET! Installed a 500GB SATA and Vista 64-bit Ultimate. Was curious about how loud the server was compared to a regular desktop. Or is it basically a vacuum? I just got my 1430sc and I got an old x300 ATI PCI-E from my brother in law. I cut the last 33 contacts off the card with a dremel to make it fit in the x8 slot. It fits and boots! Now to cut up a better card! It starts up with a sound like a jet engine, but then mellows after the boot sequence to a volume just a little bit louder than a regular PC. Now that I've got four drives in it, it is somewhat loud. Though, I have it in the closet next to my desk, so I just close the door to avoid the noise. I don't have a sound meter, so I can't really give you an accurate reading on the sound pressure level it outputs. One last thing..if you take off the cover, the fans will kick on like mad and it will sound like that jet engine again. Awesome, man! Though, because the bracket /door that holds the PCI cards down can be opened with the case closed, I've just put my BFG 8500 GT in the first PCIe slot using the adapter I mentioned and let the box run with that little door open. But I'm looking at my dremel and thinking about doing what you've done! Ok. I have dremeled another card, with not so good results. I believe that the server is a little picky with cards, not just getting it to 4x. The card I just did was a XFX 7600 GT. It posts, but it will not allow me to get into the bios. Very strange. I know the card still works because I put it in my standard desktop and its the card I'm using now. So in short, I guess it would be good to make sure the card is compatible first with one of those x8 adapters. The good news is the card is not destroyed so I can use it in my desktop system. That is weird. And your trouble getting into the BIOS is not keyboard related? glad you didn't hose your card completely! I just got a 8x to 16x adapter in the mail today. I am currently usng a X1300 PCI video card and plan to go to one of the new 8800 GT cards. It is around 100 watts lower power consumption than the GTS cards and is faster. Hopefully it will work with the SC1430. Good HOWTO on Win2008 virtualization. You'll probably learn a great deal more once this guy is in production and you've got some apps heavily using those eight cores. I'm running Fedora 7 and am currently working through a particularly natty noise issue playing sound. The noise only happens while a GLX-enabled card is installed on the box. Ok. The card that wouldn't work in the SC1430 is still going strong in the desktop. I'm just going to say, get an adapter to be sure. Advice number two... A guy at work just cut a card and it stopped working completely. It is a 7100GS with shared memory. Even if you don't want to buy the $30 adapter to test the card. Please put a piece of tape over the last 33 pins and stick it in a regular x16 slot to make sure it works. Thanks for the post, John. I'll do the tape test just to make sure. I'd rather not break the video just so that I can close that little door! As for my Fedora audio noise problem as a result of the BFG GPU, I did an end-around by plugging in an M-Audio MobilePre USB adapter. Now..no noise! Not the best solution, but at least one that works. I also wanted to follow up with confirmed RAM that works in the system. If you go to kingston, corsair, or crucial. Their memory finders will only show you ram that is super expensive to buy. However I have found ram with the correct specs that has worked perfectly in the system. Kingston DDR2 FB-DIMM ECC Fully Buffered. The original GB of ram still works with this ram, so I have 5GB available. Very good! I have added this info to the original post. Thanks John! I just dremeled the actual PCIe slot on the motherboard so I dont have to dremel the actual Video Card. It worked great. I am using the Sapphire x1950GT 512mb card and it works great. I bought 2 of them since I wanted to drive 4 monitors. One problem is that these Video Cards are long and it looks like it will hit the SATA plugs that are directly behind one of the PCIe slots...... any recommendataions? I have not dremeled the actual slot, but I may after reading your post! Man, that's a loooong one. No wonder you're encountering issues. I would think the best way to avoid conflicts with the SATA plugs on the motherboard is to measure the card length and then measure the distance from the card bracket to the SATA plugs. Hopefully, the card will be a little shorter. Otherwise, you could dremel PCI Express SLOT_2. From the pic of the motherboard, it looks like the length beyond that slot back into the box doesn't have any interfering structures. Also, it looks like the top of the card has connectors called "CrossFire Connections". Are those to connect to a second card or just power? I assume just a second card, but I'd like to know if they are power connectors, as hooking up power to a graphics card in this box is something new that I haven't done. You inspired me to try my hand at dremeling the end off of SLOT3_PCIE. So this morning (way too early, I might add), I gave myself some space on my desk and had at it with the dremel. I made as much room as possible for the procedure, by pulling back the SATA drive housing and removing both the plastic divider wall that sits between the CPUs and the PCI card slot and the memory. My hamfisted cutting technique left quite a bit to be desired, as I noticed I crunched the last row of gold leads. Since the slot only uses the 4x lanes, I figured it might still work even though the last few leads were pretty badly chewed up. I wasn't shocked when the box did not reboot properly. I double checked my connections, saw that I had a few missing as well as no memory in the box. I fixed the connections and replaced the memory and was almost shocked when I saw the Dell logo on bootup. Hooray! I video'd the event, so I'll post it after some editing. Thanks for the inspiration, Mario! And for those of you listening, as Mario and I have done it, it IS possible to dremel the end off of one of the PCIe slots in order to fit a 16x graphics adapter in the SC1430. Just BE CAREFUL!! just got my SC1430. Added 4GB (2x2GB) memory (rank 2) and run memtest64+ 1.70 for several hours without any issue. The original memory modules are single rank which is slower than the dual rank ones. I am wondering where to put 3rd and 4th HDs. Are you using a 5.25" bay to put the 4th HD? Since the HDs are running hot without good heat sink/fan. I am worried about putting 2 HDs in the 3.5" bay without any heat sink/fan. I hope to use a PERC 5i with 5 HDs in the SC1430 doing RAID5. The original 80GB SATA is slow. It seems that SC1430 has 6 USB 1.1 port and 1 USB 2.0 port. Not yet figured out which one is USB 2.0 port. -two 250GB SATAs, courtesy of Dell with the original purchase. The SATAs are in a Fedora software RAID0 configuration. The SATAs are in the SATA drive bays and for convenience sake, I put one IDE in the 5 1/4" slot and the other in the 3.5" slot below that. Finally, according to the product details here (Additional Specs), all the USB ports are 2.0. Just for a record, the old PCI NVIDIA Quadio NVS vidso card works on a PCI-X slot to support 4 displays with 7.1.8.4 driver. After install the correct driver, I now see the USB2 Enhanced Host controller 268C. I've edited the main entry with this info. or put the details of the card, when I searched i saw many cards with the chipset you described... i am not sure if any of those will work? Took me a long time to do those darn transitions! However, if you don't need 4-monitor support, you can probably get a much cheaper one that support single monitor. Finally got my SASx4 to 4xSATA cables. got PERC 5/i RAID HBA for $80 from ebay. 3-in-2 SATA bays from newegg.com. put 5 SATA HDs and make 2 Virtual Disks on RAID5. My SC1430 is almost ready for VMware esx 3.5. I just hope the onboard NIC works for ESX 3.5. Are you utilizing those four monitor outputs? I'm currently using 2 monitors. my friends use 3-4 monitors with the same card on different machines (Windows XP). It is ok to watch multimedia clip/dvd on any of the monitor it connected to. Never tried to play modern game on it. Did you ever get the 8800GT and install it in the box? I'll answer my own question here: YES, the BFG 8800GT 512MB PCI Express works in this box if the box is modified to accept 16x PCI Express cards. Though I don't have all 16x lanes, glxgears reports a respectable 12200FPS. Thanks for the heads up on the 8800GT. I've been holding off on the card waiting for prices to drop. I now have a reason to snag one. Yes, it's a nice card. Be advised: you should take off the little OC sticker that sits on the fan. It's been known to come off and jam the fan. I removed the sticker on my 8800GT after a few hours of the card being on. That way, the glue has softened a bit and the sticker is easy to remove. Did you ever get ESX installed on your 1430 free_2_go? I've got a 1430 too and it works great with one exception -- ESX doesn't recognize VT support so 64 bit guests won't work. Otherwise it's a rockin' box! Hi, I stumbled upon this post - I just picked up this model - dual quad core from Dell last week. Managed to get an ATI x1550 running (x1 connector) running as my primary video card, but I'm thinking about adding a second monitor. Do you know if I can just add a second x1550 in the other PCIe slot? I was able to run two NVidia cards at the same time: the 8500GT and the 8800GT. So I assume you shouldn't have any issues. Glad it worked for you too. I too chewed up the last row of the slot but I knew they were not used since its an 8x slot but only the first 4x are used. I am noticed a slight choppyness in the server when doing everday tasks. Most noteably is when you move the mouse around the screen very fast I notice it is choppy. Also when scrolling in IE. Sometimes even when I typing, like I am now the typing lags. Any ideas or tweeks to do? I heard the HD write/read speeds are slow... so i thought that might be it. On a side note I also installed a sound card and it works fine in the pcix slot. My main OS is now Fedora and I have not experienced the laggy mouse action you are seeing. From your post, it sounds like you're on some flavor of Windows. XP or Vista? I've heard that Aero on Vista is a real hog, but I have no real world experience with that OS to confirm that. 1) look at what Task Manager is reporting. You should have plenty of available physical memory. Also, make sure your CPU utilization is low. gimme a shout back if you find anything. I used your little BSEL mod video tutorial to mod my 1.6ghz sc1430 quad core to 2.0ghz. It works great. Thanks for posting. OK, I bought two of these systems for someone at my job. The price is so ridiculous i might buy more if I can get some graphics to work. Of course I couldn't get a straight answer out of my dell rep as to weather or not I could put any aftermarket graphics card in that x8 slot. My dell rep also told me Windows XP is not supported on this system. SO I bought two ATI Fire MV 2400 PCIE x1 quad graphics cards for this box. I've tried the cards in both pcie x8 slots and have had no luck getting any display. Maybe its because of the two gpu? Support for aftermarket video cards is where the benefits of this inexpensive machine falls down. So far a I have a bunch of cards that don't work in this box. 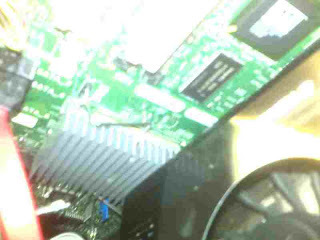 I got close with a couple of 4 head PCI cards by Matrox and Colorgraphic as in the Dell BIOS was able to see them. But with those cards IO get BSOD all day. I can't even boot into safemode without the BSOD. Those were PCI cards though. As for PCIE the Fire MV 2400 doesn't work. Nor does the PNY NVIDIA Quadro NVS 440 PCIE x16 through the riser. I'm using the other x8 slot as a harddrive controller which for my SAS drive. Im not running a RAID array so I suppsoe I could ditch that card. I wonder if that would help at all from a power consumption stand point? If anyone has gotten a four head display to work on this box please let me know what cards you used!?!? For Erick Wipprecht, you need to enable VT support in BIOS. SC1430 has the CPUs and NIC supported on ESX 3.5.
freee_2_go this morning I tried installing a PNY Quadro NVS 290 x1 in pcie_3. 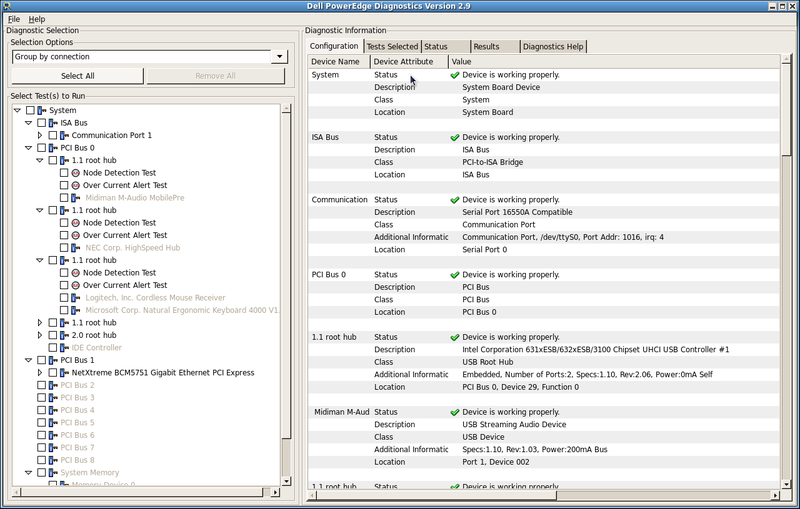 I also have the dell LSI SAS atdapter in the other pcie slot. There is some sort of interaction between these two that causes an ~5 min period of blank screen before boot or bios setup. (I only discovered this accidentally by leaving for a meeting while it was in this blank screen state.) If I remove the SAS adapter the problem goes away... of course so does my boot volume. I've fiddled with several bios and LSI adapter settings with no luck. Are you seeing this type of delay? Any ideas? As it is this is still better than the GeForce FX 5200 (Jaton 228PCI-Twin) that I had in the PCI slot. That card wouldn't let me rotate a monitor, and it also produced random artifacts on the screen. The NVS 290 was ~$150 from Tiger Direct, much cheaper than the NVS 400 class boards which go for ~$400. That's about it. Maybe someone else has seen the delay you're talking about. Swapping the slots for the LSI and NVS card seems to have improved things a bit. I get up to a 4 minute black screen delay on bootup with the SC1430 using the NVidia 9600 GT SC. I don't mind it since the computer is always on and the card is smokin' fast playing Crysis, Video and etc. Huh. With the BFG (NVidia) 8500GT and 8800GT, this delay doesn't occur. Mark, I do not notice such delay. However, I use a very old PCI Quadro NVS. Im going to receive my dell sc1430 its not exactly a computer for be using in my case as a server, my brother works in a computer store and he noticed that in dell store web there was a bug with price of dell sc1430 the configuration he made just cost 125 € yes i said 125€ mainboard 2 gb memory, 3 years warranty .... so he didnt think and blught it ... later we call dell and ask about that bug ... they told us person responsible of that bug had been fired and that we would receive the computer of course at that price 125 € ... ok good buyng now we want to know we have a pc with a nvidia gforce 8800 gt does it fit in dell sc 1430 ok? if not what options do i have? ... what tipe of adapter do i need to make it work in sc1430? is there a problem with installing drivers in that computer and make work that videocard? ... how does games run in dell sc 1430? i love gaming and im interesting in knowing if last games like crysis, age of conan, world of warcraft ... will work ok on it .... Why dont u put a video with the performance of games in that computer? With option 2, you'll need to keep the little door that holds the adapter cards open all the time. But these options are further detailed in my original post and shown in one of the videos. I use the box more for video editing than gaming, so I don't have much data on game performance. Good luck and have fun with the new box! Frre2go, do NVIDIA QUADRO NVS400 PCI QUAD HEAD need pci adapter 8x-16x ?? it looks like the card is a full, 16x PCI Express video card and will need you to either buy the 8x-16x adapter card or dremel off the end of one of your PCIX slots. As it is easier, I recommend the former (buying the adapter). I no longer heard the crackling. Also, using the onboard ATI video did not interfere with the audio. I hear that people using Windows don't have this problem, but be advised that it could be a possiblity if you use Linux. Huh. I used both a Delta 66 card and a SB Audigy LE and both cards were detected by Fedora. However, they both exhibited that noise problem when combined with the NVidia card that I told you about in my last post. Not sure why XP wouldn't recognize the card. Of course, if you look on Dell's site for supported OSs, XP is not one of them. Yes, i want to use linux in my experiment, but this don't work and had to use Plan B (WinXP x64). Plan C is Vista x64. Thanks for the great tips on this blog. I'm having some (actually a lot of) trouble installing a BFG 8800GT OC2 on this sc1430. I get the BIOS screen and after that blank screen. I don't even get to the Setup page if I press F2. I've left it for over 10 mins. 2) Disabled 3 1 TB drives. 4) Tried with DVI, VGA. 5) Tried another card ASUS EN8400GS. How are you guys connecting the PCI-e power to 8800GT. Maybe that is the key. The PCI-e power cable on sc1430 is not long enough to reach the card. How did you guys extend it? I was connecting using 2-molex-to-PCI-e Y cable that came with 8800. I have only one molex and one SATA power connector left in my sc1430. So, I used the remaining molex to connect to one of the molexes on Y. I used a SATA-to-molex adapter to connect to the other molex on Y to connect to card. Is that a problem? How did you guys get 2 molexes free? - BFG 8800GT OC2 refuses to work in my setup. Even tried with external power the card with a separate 850W PSU. No go. - Finally tried Sapphire ATI Radeon HD 4850. This worked!! Has anybody successfully configured VisionTek X1300XGE 512MB PCI Express X16 card ? I would be happy to buy the PVIe 8X to PCIe 16x adapter, but need to know whether it will work. Hi, what is the power consumption difference between the sc1430 @ 900 Watts and regular optiplex @ 300 watts. I see the numbers but I can translate it into money... is this sucking up a lot for home. If you look at the specifications on Dell's site, the power supply is rated at 750 watts. I haven't measured the cost of running the box. I have it running when I edit video only, so it is not on all the time. I don't have a list of compatible cards for the box. That would depend on the OS you're running. 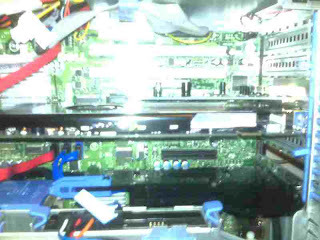 I was successful in getting a BFG Tech GeForce 9800GT 512MB working with the PCIe riser board. After using it as my workstation (moved it from the server room) I was bothered by the sound output from the fans. I modded the 2 internal 92mm fans and the box is now SILENT! The sound output of the box was drastically reduced by changing these 2 fans. I did run into some peculiar difficulties with the installation of the fans. I used 2 different brands of fans. I also had to purchase this adaptor cable. 4-Pin PWM to 5-Pin Dell Adapter Cable allows you to plug your choice standard 4-pin PWM fan to a Dell's proprietary 5-pin fan header. So I got the fans mounted and cabled up. Booted the PC and got a BIOS error message stating the Memory Fan was alarmed. I checked the fans and they were both working when powered up..so I decided to switch the power couplings and plug in the GELID fan into the memory fan power dongle. Rebooted and everything came up as expected. For some reason the Arctic Cooling fan was not being properly recognized by the BIOS. I would recommend the GELID PWM fans...and I'm lucky I ended up with 2 different brands..or I would have still be scratching my head. The fan mod is an interesting one. Thanks for the detailed update. Though a great deal initially, this box has cost all of us a lot of time. Well worth it though, as it is a real workhorse. Thank you for this useful post. I have the same box but I don't want to buy an adapter nor cut the card. I want to use the PCI slot for video card. Could anyone advice me if the following cards will work? Additional info: I use the box in an office environment so low gaming performance is not an issue for me. I need to have at least 1920x1080 for one of the dual monitors I am trying to set up. If I were you, I would buy one of the cards listed in this thread that are known to work. Though it'll cost a few bucks more, it'll save you time and hassle in the long run. Just in case anyone is in the same situation as me. I purchased and installed EVGA GeForce 9400GT 512MB PCI. It works flawlessly on under Ubuntu. Dual monitors 1920x1080(DVI) and 1024x768(VGA). I don't think I can play any graphic intensive games with this card. Tried to play full screen HD video on YouTube got very choppy result. I am totally fine with it however since it is only used as an office PC. Has anyone tried to run the X5365 3.0Ghz processors in this motherboard? They came out after the mb was produced but it is the same slot and chip design. I wanted to see if anyone tried it before i buy one. Worst case i sell it back on ebay. So I would think you should be able to. Try it out and let us know. And if that's the case, I'll buy a couple myself! Thanks for the information on sc1430. My motherboard on the sc1430 went bad. Would you know if I can use the heatsinks from the sc1430 on any other intel server motherboard. You'd just need to verify that the form factor of heatsink clamps on the server motherboard you wish to use in the SC1430's case are the same as the original mobo. However, I'm sure you could get away with using aftermarket heatsinks. Haven't tried them, though. If you do setup another mobo in the SC1430's case, please post back here. I'd love to know if you get it working. I used the Abit Wifi AirPace, since its a 1x PCIE card, fits the 1xpcie slot and works fine. For windows 7, and Vista the trick was not to use the abit driver for both x64 and x86. Go to the select manual driver and pick the Atheros chip under network adapter in the control panel. "this card is actually an atheros chipset card, simply uninstall any abit driver and install the driver for the card manually using Windows 7 default drivers under 'Network Adapters', pick either Atheros AR5006X or AR5006XS"
I'm using an NVIDIA Quadro NVS 290. OK..I just added to the main section up top..thanks Mark! Seems I'm having a similar problem to you guys with the install of the 3ware 9650SE RAID card. It now takes the box about four minutes to boot Fedora 12! The problem appears to be some sort of conflict with the two PCI Express cards that I have in the box: the NVidia 8800GT and the 3Ware 9650SE card. Once I removed the 8800GT video card and used the onboard video, the box booted up in about 40 seconds! Initially, the two cards shared IRQs, so I re-ordered them to use different IRQs. No change. Then moved the IRQs around a couple more times just for kicks. Still no go. If anybody has an idea as to how to solve this, please let me know. So, I've got two PCI Express slots in the box. When I swapped the RAID card and the NVidia card in the opposite slots, the box booted up in a flash. The problem with this, though, is that the bottom slot that worked accepts only 8x cards. I used an 8x-to-16x adapter in this slot to fit the 16x video card in the configuration that has the fast boot. Unfortunately, using the adapter raises the card in the slot and I can't close the hood on my box or fit the second of two DVI connectors on the back of the video card. Of course, I could dremel the end off of the second 8x connector but that's a friggin hassle. The best solution would be to find out the mechanism that controls the PCI Express bus..or at least the ordering of PCI Express cards in the boot process. Again, unfortunately, the BIOS is stock Dell, so I am somewhat hosed. Is it possible to reorder the PCI Express cards somehow? Of course, there is no such option in the BIOS. So whaddya do when you a sticky problem? I must say I did a much better job this time. Now the box boots up in 40 seconds instead of four minutes! Another Video card, except now its a power house with a multitude of features, TV/remote included. The system booted up fine on the pice slot install. The card is fairly long, and fits only one of the PCIE slots. My system went up to a 5.4 video graphics for W7. Theres a firmware, but I cant find it on ATI, since its AMD now. I will add to the list of working cards. I need help, please guide me on how to install the 4th drive, in the front panel (currently too wide). 2 x HD The original the 2 bay side installs were easy. 1 x HD One drive in the front panel was easy as well - this was how it came installed. ?? The other drive bays in front are too wide for 3.5" HD. So, the fourth drive install is puzzling me, I am newbie so please help. I called dell and they want me to buy some plastics for 30$!! oo - Did you pop the front plast panel. I popped the front panel and installed the 3rd drive, however I didnt get to the 4th drive. I ll head home and check this. Just used one of those oscillating fein multimaster clones to cut the back of the slot out. I tried both a gf210 and gf9500gt. Both of the cards posted but never allowed getting into the bios screen or past the KMS portion of a linux kernel boot. Just ran and grabbed an MSI 4350 and it booted up. Posting at 1680x1050. I'll bring this machine to work on monday and it'll become my primary desktop. Did you manually set the resolution of the bootup (1680x1050) with a kernel parameter? If so, what kernal param did u use? Regardless of the caliber of the card (48 pipelines/shaders 128 bit processing), I beginning to see some video lag on the system if I cross 15 windows. Even using windows 7. Svr 2008, Vista 64. EVGA 512MB Geforce 8400GS PCI card did not work for me. Thanks to the pioneers of the sc1430. This is still a relevant thread! I'm using a PCIe X1 ZOTAC ION-GPU-A-E ION Graphics Processor 512MB in slot 3. Supports DVI, VGA and HDMI. 370.00 (eBay), Perc 5i 512mb raid memory 60.00, battery backup for raid card 18.00. Install Vx64 w/o Video. Then add PCIeX1 card. Used two monitors for install. I'd like to know if there's a correct way to mount the perc 5i battery in the sc1430. I can't seem to find the holder and I don't want the battery to dangle around in free form. Please let me know if you have the answer. Much thanks and great blog!!! Haven't had to replace the battery in my SC1430 (surprisingly). Give the manual a look (links above). I "mounted" my battery to the plastic divider/heat shield using duct tape. If I may ask, where did you get your replacement battery? Hi, Not sure if I came off clear. I looked over the pdf manual it doesn't mention anything. But would it be possible to perhaps take a picture of your sc1430 inside showing where you're placing the perc 5i battery? I have the battery connected to my Perc 5i card and I used double-sided tape to stick the battery on the Perc 5i card to prevent the battery from moving around when I move the computer as there doesn't seem to be any sort of proper mounting mechanism to holder the battery in a secure manner. Much thanks! I have no idea what the dell oem solution for mounting the battery was. Your double sticky tape solves the issue of the battery flopping around. As far as sending a picture goes, the system is in a difficult spot and is rarely taken off line. The next time I open the case I'll try to remember to snap a photo for you. It has HDMI audio output too and the cost is around $99. Where did you get your replacement battery? I ordered a couple replacements from hong kong off of eBay but they weren't compatible, they were for the perc 6i. The seller stated that the battery would be compatible, but the cable would not be compatible. I had the perc 5i battery cable but the batteries themselves were not compatible. I'd like to get a replacement from a source that I know will work. I've ordered my Perc 5i Battery off from Dell.com. It cost a little more, but it's the original and you know it'll work 100%. After my experience ordering batteries off e-bay from Hong Kong, I'd suggest other users do the same. Haven't tried that card, Edmundo. I'm not sure. I bought the card within a few days come and prove it, I commented how it goes with this. I get the adapter and I've tested. the adapter does not work with the server chassis, since there is no way to accommodate the card into it. I tested the video card RADEON HD5450 SAPPHIER (http://pcfactory.cl/producto/11342-Video.AMD.Radeon.HD5450.1024mb.DDR3) with the adapter and it worked correctly. I made some videos where I tried several options for the video card. The video card ati radeon HD5450 works fine with an adapter, did not try any games but I will soon ... on the adapter that I published, does its job but not for this chassis, which can not fit it in any way in the chassis. Nice work. Thanks for the contribution. I understand this is an old thread, but I am planning on picking up a SC1430 next week, I am getting it with 4gig ram and a pair of xeon quad cores for under $200... I am not a gamer so I am not concerned with playing high end games, but is the on-board video suitable for watching hulu or youtube videos? I usually watch vids now at 360p or 240p because my internet is so slow... I also use VLC to watch movies on my network and local hard drives... I am an avid Linux user, I was wondering if you could see any reason why Linux Mint 64 bit or Ubuntu 64 bit would cause me any problems. I will be using either Cinnamon desktop environment or XFCE. Also, was a solution for the funny noises when using a pci sound card ever cleared up? Would I just be better off getting a USB audio device instead? I appreciate any help you could provide, since I'm not really looking to buy a new video card I am hoping this will be suitable for my meager video tasks. 3) I never got to solve the weird audio problem in Fedora..not sure if other distros have that problem. I just moved to using USB audio. See how your other distro's do..if you have to go to USB, then at least you have a solution. Using it with great success on a media server. Although my WS is also hooked to TV, if my WS goes down I can still watch media from my server. The HDMI output has audio, no sound card needed. Thanks for the nice addition. I might try this card myself. Tho, I'm a Linux user and have concerns about AMD/ATI's lackluster OpenGL2.0 support. Im so glad I found this blog! I have an sc1430 that I want to add a graphics card to. So I bought a bfg 8800gt 512mb card. I decided to cut a notch in the card and not on the back of the slot. My cut is good and in the right place! After installing the card I get the dell boot screen and the second screen that gives the boot options. I can get into bios and everything seems good until I try to boot off a drive and usb stick. I get a black screen for anywhere between 1s and 60s then it reboots. 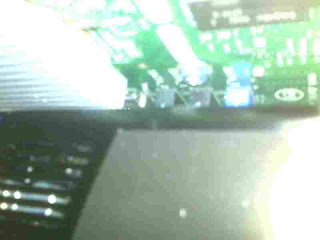 I have tried soldering a wire on the underside of the motherboard telling the board it is a x8 card (I think I soldered a1 and b49) but I still get the usual black screen. I have run the system barebones, with just 2gb ram, with and without the other pci-e slot filled, disconnecting the ssd and booting from a usb stick and I have also tried changing all the irqs around but I always get the black screen then a reboot. I will try the jumper wire setting the slot to x4 and if that fails to x1 but im wondering if anyone can help shed any light on my problem. Most say the card works out of the box (almost!) so maybe I just have a duff card? Not sure. Probably easiest to try an el cheapo card that is on the list of good ones to verify if your card is bad. I dremeled out PCIe slot #3 on my motherboard and I have been successfully using an Nvidia GeForce 6800 with the Dell SC1430. I also added a cheap audio board and the system plays/transcodes movies and runs games (Sims 4) just fine. Reinserting the Geforce 6800 restored full function to the Poweredge. Thanks for the note, Kevin. Good addition to the compendium. I can confirm a 3dfx Voodoo 5500 PCI card works ok. I have it placed in one of the PCIX slots because I have an Audigy 2 soundcard in the PCI slot. I haven't tested any drivers yet but the screen doesn't skip around anymore so i'm happy! I am thinking about upgrading my RAM and CPUs and want to get the fastest possible. Dell says the fastest cpu you can install is the e5320 (1.86ghz - 1066mhz) but this blog says that the e5345 (2.33ghz - 1333mhz) works. Has anybody tried the 2.66 or 3.0ghz cpus? Or are there any other lga771 processors that work? And, am I right in thinking the best ram setup is 2gb pairs of pc2-5300 (ddr2-667)? I just obtained a PowerEdge Sc1430 and read up on these posts about upgrading the graphics card. I chatted with Dell and as you can guess they don't support upgrading graphics cards in server class machines. I found a NVIDIA Quadro NVS 420 by PNY 512MB GDDR3 PCI Express Gen 2 x16 VHDCI to Quad DVI-D SL or DisplayPort Profesional Business Graphics Board, VCQ420NVS-X16-DVI-PB graphics card and was wondering if that would work in this machine. I found this graphics card while looking online. The card is a NVIDIA Quadro NVS 420 by PNY 512MB GDDR3 PCI Express Gen 2 x16 VHDCI to Quad DVI-D SL or DisplayPort Profesional Business Graphics Board, VCQ420NVS-X16-DVI-PB. Please let me know if it will work. I bought a PNY Quadro NVS 290 PCIe 1x with 256 Mb (20$). It works out of the box. But I need more power because I want to transform my sc1430 in an Arcade Machine. So I bought a ZOTAC GeForce GT 730 PCIe 1x with 1G DDR5. I'm waiting for it. I'll tell you if it works or not. Im starting to set up my SC1430 as a home server. 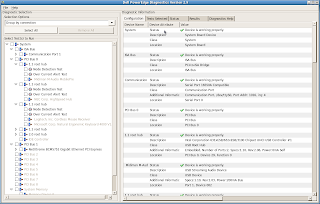 I am looking at using freeNAS off a flash drive. This will take up a lot of RAM. I have 8GB installed right now, but dose anyone know if there is a way of getting up to 16GB of RAM into the box ? I wanted to use my SC1430 as a freeNAS server for home use. I want to run off a flash drive, and I know this will eat up a lot of the RAM. I have 8GB installed right now that is listed as the boxes max. Is there any way of getting more RAM into the box ? Did you got any result with GT730?